The Treehorn Express is dedicated to the cessation of Kleinist NAPLAN blanket testing in Australia. Our recently introduced Australian schooling system is based on one introduced to a New York school district by a lawyer, Joel Klein. in 2002 and copied by Australia’s Ms. Gillard in 2009, without consultation or examination. Now, the key-stone for Australian schooling is the administration of blanket testing of some measureable items for each child every second year, in May. Upon the results, teacher, principals and schools are judged and rated. Mr Klein, the founder, now heads the Murdoch test-publishing company worth billions! Australian test-freaks are amongst his disciples. Why have it? Kleinism is a New York version of fear-driven schooling which separates ‘haves’ from ‘have nots’ and opens the door for mega-bank-rolling by known curriculum vandals for control of school-based learning. That’s why it exists. It disrespects school pupils, devalues teachers’ professionalism, forces States to prescribe school texts and teaching strategies, threatens Australia’s future and rivals the Perth Mint as a money source for the top end of town. Why does Australia support it? Why? Money. Rupert Murdoch will be pleased. One of his colonial possessions has taken the initiative and is about to expose the dreadful state of schools in the the state of Queensland, Australia. It makes his own task so much easier. While school authorities in the USA are pleading: ”Release our schools from the control of Rupert Murdoch.”, the Courier Mail [Friday, 27 Jan.] headlines “Good and bad of our education revealed”. Go Rupert and Joel. Your troops are loyal. The article forewarns: “Individual school-by-school marks will be revealed after a six-month battle by this paper for the results” in tomorrow’s issue. It says that the State Government has carried out ‘audits benchmarking all of its schools’ and supplied the material to the newspaper. That should earn the government’s candidates thousands of more votes from the teaching/parent fraternity at the coming elections! “Revealing school marks” will be about as useful as revealing how many school children carry a hanky… but some people will make judgements about the worth of schools and praise the Naplan blanket testing system for revealing such profound information. Families will be packing to head for Wonga Beach [as Kevin Rudd advised parents to ‘walk to another school’], north of Cairns because the marks reveal that it was “one of three to achieve an outstanding rating for the ‘effective teaching categories’ practices category. The four-page lift-out in tomorrow’s C.M will cause a massive increase in daily circulation….and migration. Comments from child-protecting agencies such as the Q’ld Council of P&Cs, the Q’ld Assocation of State School Principals, the Queensland Teachers Union, and all Independent School organisations will proffer their professional opinions in subsequent papers; and they will be measured by the metre. Treehorn will be thrilled. He is being noticed. Learning is different from such gathering of marks of a few school items. Their relationship is fragile. Learning is an individual and personal matter. It is immoral for anyone beyond my child’s learning experiences to make judgements about the outcomes of his exchanges with me or his teacher. The evaluation of his efforts at school and at home is his business. I am very interested and so is his teacher, with whom I share his progress. IT IS NO ONE ELSE’S BUSINESS. I did not give permission to any group or politicians or measurers to mention my child’s effort within his class or school context. Leave him out of the numerals that are used to judge the learning experiences of his collectivity. So there. “Education Reform: An Order-of-Magnitude Improvement. Imagine the present corporately promoted education reform effort as a truck, its tyres flat from the weight of the many unexamined assumptions it carries. Right now, the biggest, heaviest assumption on the reform truck has it that, when Common Core State Standards Initiative is complete – when someone has decided exactly what every kid is supposed to know in every school subject at every grade level – the education reform truck will take off like gangbusters. It won’t. If all the reformers’ flawed assumptions are corrected, but the traditional math-science-language-arts-social-studies “core curriculum” remains the main organiser of knowledge, the truck may creep forward a few inches, but it won’t take the young where they need to go if they care about societal survival. The mess from this generation’s political paralysis and refusal to address looming problems can’t be cleaned up using the same education that helped create it. What’s wrong with “the core”? For its content to be processed, stored in memory, retrieved and combined in novel ways to create new knowledge, it would have to be well organised and integrated, It isn’t. It’s a confusing, random. overwhelming, intellectually unmanageable assortment of facts, specialised vocabularies, disconnected conceptual frameworks, and abstractions – the whole too far removed from life as the young live it for them to care about it. So they don’t. They’re being blasted with information at fire-hose velocity. The diligent and the fearful store as much as they can in short-term memory, and when testing is over, their brains delete what’s considered clutter because it’s not immediately useful. The non-diligent and the cynical guess and/or cheat the answer sheets. The rest [and their numbers, understandingly, are steadily increasing] opt out of the trivia game, or are opted out by thought, caring parents. When the CEOs and the politicians they’ve bought finish the simplistic “reform” they’ve started, when the claim that an order-of-magnitude improvement in learner intellectual performance has been dismissed as hyperbole, when all states have been pressured to adopt the Common Core Standards [aka National Curriculum] locking the knowledge-fragmenting subject-matter tests that can’t measure the quantities and quality of thought have been nationalised, and when the Standards and Testing Police are fully deployed and looking over every teacher’s shoulder, it’ll all be over. America and the nations that follow its lead in education [That’s us ] will face a dynamic world equipped with a static curriculum. Come on folks. Get off the fence. Say something to somebody who might be able to help our kids. Parents can stop the malignant practice by telling their school that they don’t want their children to contest NAPLAN. Politicians can stop it if a few fair-dinkum Aussie ones stand up for Aussie kids in their Parliamentary Party Room. Principals can stop it by refusing to have their professional ethics battered any more. Teachers can stop it by saying ‘enough is enough’. We like our kids. OtherTreehorns ? : Check Recent Posts and Archives in the sidebar. It disrespects school pupils, devalues teachers’ professionalism, forces States to prescribe school texts and teaching strategies, threatens Australia’s future and rivals the Perth Mint as a money source for the top end of town. Why does Australia support it? Why? Money. You have seen the current advertisements on TV – buy test-practice books – approved cheating on a large scale – making a mockery of what Australia could be – a really advanced, educated society – where love of learning and achievement is happily pursued. A well-known contemporary author, school consultant and commentator, Bruce Hammonds refers to people, who remain embedded within a professional occupation, but ignore its raison d’etre as well as the effects of changes to their profession’s operations; and who maintain an unhelpful silence when their clients are badly treated, as undead. They haven’t been interred and still possess movement of a kind….sorta dead but they won’t lie down. They cannot or will not speak up and thoughtlessly assist superordinates in flagitious operations that impact seriously on the welfare of clients. The term is a most suitable one to describe those who just go with the flow and find it easy to ignore professional ethics. That’s why it’s a Treehorn topic. Those who claim membership of the teaching profession, but don’t work at its raison d’etre, nor read much about it, nor share opinions about it on a professional level, nor worry about it, nor have any great view on how to care for kids are conspicuous amongst the ranks of the undead. The profession can do without them. Some run our schools….public, systemic and private. Classroom teachers in a public school system can openly claim to be amongst the highest of professionals if they are conscious of and proud of what they are, and what they are expected to do. As a rule, members of a public school system know what teaching and learning is all about [there’s the rub] and they care greatly about the demotic children who turn up on the school’s doorstep. If you have been in a school, you know that they do their tasks with great love and determination. True blue professionals. There is no picking and choosing of clients, no specially chosen school in which to serve. The description is real. If the superordinates are from beyond the profession or are of limited experience in the school classroom, yet exert controls over the operation of the work-place, teaching time and syllabus modus operandi that infringe on an operator’s professional standards, there is tension of many kinds. What happens in the normal classroom and its place as the learning centre for the school curriculum cannot be absorbed into the psyche of such superodinate controllers through texts or by casual observation. It’s an intricate and complicated operation. To pester the learning atmosphere with foreign blanket tests or aim a national curriculum at the said tests is aperient. If the tests are their own and concocted without respect for the learning climate, the complications are prodigious. A senior officer of a state education department told ABC Radio recently [Monday,23 Jan.] that the new national curriculum was so good that the Year One children would do ever so much better at NAPLAN tests when they get to Year 3 than others have ever done. Unbelievable. I’ve been waiting for an outcry from professional representatives in the press, haven’t you? This is the purpose of the new curriculum? The compliance of Australia’s undead is legendary. Despite their collective knowledge of the dangers of blanket testing, for instance, they succumb….too easily. They not only jump to commands, but they join the spoilers to improve the presentation of the deadly tests. The rights of the child are abused by such undead operators. UNESCO, by the way, has a lot to say about the rights of children. These rights are ignored and untested. Governments love the undead. In an article called “Education Deform as a Farce” http://theassailedteacher.com/2012/01/19/education-deform-as-farce/ the USA author speaks of the power of propaganda. During war time, conspicuous people and the media were paid to support the war through silence and ‘proper’ comment. Remember that few Australians knew that Darwin had been bombed as often as it was, hidden by silence; and a later PM assured us that there were WMDs in Iraq when he sent our soldiers there. “The tactic is so powerful that it has the ability to make lies true”, says the author. [Come on Aussies, come on..true blue child-oriented ones. If you have 4 minutes 17 seconds to spare from your busy schedule, click on the theme song “Care for Kids” above, relax and ‘take in’ the words. Meditate. Calm your anger. Enjoy. For their sake, just say NO to NAPLAN. Other Treehorns ? : Check Recent Posts and Archives in the sidebar. The Treehorn Express is dedicated to the cessation of Kleinist NAPLAN testing in Australia. Our recently introduced Australian schooling system is based on one introduced to a New York school district by a lawyer, Joel Klein. in 2002 and copied by Australia’s Ms. Gillard in 2009, without consultation or examination. Mr Klein now heads the Murdoch test-publishing company worth billions. Australian test-freaks are amongst his disciples. Kleinism is a New York version of fear-driven schooling which separates ‘haves’ from ‘have nots’ and opens the door for mega-bank-rolling by known curriculum vandals for control of school-based learning. That’s why it exists. It disrespects school pupils, devalues teachers’ professionalism, forces States to prescribe school texts and teaching strategies, threatens Australia’s future and rivals the Perth Mint as a money source for the top end of town. Why does Australia support it? Weird. Come on folks. Get off the fence.Say something to somebody who might be able to help our kids. Attached is an outstanding paper from an outstanding practitioner,known to many for his successful, innovative practices. It is eight pages long, hard to read on the fly [so to speak]. Dare I recommend that you print it out and, when you have the time, read it very carefully? It is quite outstanding, full of common sense. It’s about the best child-supportive comment on NAPLAN that I have read. It signals some very important warnings as to the destiny of those unfortunate pupils who have to endure NAPLAN. They are our Australian kids, and Derek’s comments are telling. Indeed, it presents some serious points of view that few of us have considered. Firstly, those who are naive and misled either through ignorance or apathy and I hear you ask what is the difference. Secondly, those who are scheming and evil in their manipulative intent. National Assessment of Politicians’ Lightsome Naivety. National Assessment of Politicians’ Lassitude and Neglect. National Assessment of Politicians’ Laziness and Nonchalance. National Assessment of Politicians’ Liabilities and Negligence. This means that we will, as a measure of accountability for our children’s happy and purposeful school learning, be assessing and sharing, with fellow voters, our local member’s [and all political parties’] neglect and laziness [ Do they say anything enlightening about the issues in their speeches and statements? ], when it comes to getting rid of national blanket testing? Do they know the alternatives for effective evaluation of pupil progress. Are they so non-caring? Do they agree with totalitarian [Nazi-like] methods to ensure school compliance and teacher silence? OR What do they think of having an Australian child-loving, achievement oriented [sky’s the limit], love-learning, cooperative and equitable system? Can we learn from Finland and improve on its ideals ? Will our local member tell us about what’s so wrong with promoting respect for teachers; with training them and paying them well? Will they vote in their party meetings and in parliament for NAPLAN to be banned? OR Will they take the coward’s way and vote for its modification? Will my member stand up for kids at the party meetings? We can all look forward to the next 20 months of interesting teaching/learning dialogue. Right? Any more suggestions? Did I miss some? Derek Hedgcock [“We Catch More Flies with Sugar!” P.8] says : “NAPLAN is simply a compliance based, bullying approach to schooling. As is universally the case with every instance of bullying, it reveals more about the fears of those who design, promote and support it [whether by direct action, sycophancy or by timid compliance] than it contributes to any form of worthy education, such as all our children deserve and need. If we are to emerge into the unknown challenges of the future, we need, as best we can, to apply a combination of ancient wisdom with the emerging sciences of learning. If you have another 4 minutes 17 seconds to spare from your busy schedule, click on the theme song “Care for Kids” above, relax and ‘take in’ the words. It’s quick meditation. Calm your anger. Enjoy. Other Treehorns ? Check Recent Posts and Archives in the sidebar. Come on folks. Get off the fence.Say something to somebody who might be able to rescue our kids. We should not have to wait for the next election when un-Australian supporters of NAPLAN will be turfed out. Today’s Courier Mail [18 Jan.,2012] unkindly headlines State Tops Cheats on Naplan. ACARA the governing body for the administration of NAPLAN, and now clearly in charge of the Australian schooling system as designed by Joel Klein [see above] , has recently released its report on incidents attached to the 2011 NAPLAN tests. It’s a riot. You will find the report when you open the http://www.saveourschools.com.au article “Several Schools Found to be cheating in NAPLAN Tests”; and click on the access in Para 5. Thirty-one un-named naughty incidents at schools are listed as “Incidents Investigated and Substantiated” [as at 15 December, 2011]. Please stop laughing until you have read it. Not one mention was made of those schools that deliberately practised for the tests nor of those that used test-practice books in school time. Big-time ‘cheating’ of this magnitude seems to have been ignored. Intense practice is done only to influence results, and those who practise better or longer get a greater advantage. Those who teach the full curriculum until May are clearly in the purest condition for serious wide-scale testing; but they are at a disadvantage as far as test results are concerned. And those who are in a multiple grade situation, such as a small school, won’t be able to have their practice sessions supervised as diligently as a single-class group. There is a clear advantage to a school that has single-grade units with lots of help, lots of time and lots of money. Those of them who do the most practice, cheat the most. Some schools have been reported in the press as concentrating on NAPLAN practice in Years 1 and 2. No mention of this in the incidents report. Next year’s report, maybe, if NAPLAN lasts that long. Confusing and farcical, isn’t it? Is there mention of what happens in large schools that believe in the effectiveness of multi-aged learning? Must they succumb to less effective forms of single-aged instruction because blanket testing almost demands it? Since practice seems to be the approved norm for Australian school systems, shouldn’t multi-aged schools of all kinds be given a choice of contesting NAPLAN or not? Is our system of learning for children at school becoming shambled or not….for the sake of some distant measurer’s score…or a special politician’s self-aggrandisement? It is clear that that no reliable or valid statement about mental capacity, learning ability or teaching expertise can be made about any person, school, suburb or town, based on any form of blanket testing. Such comparisons are grossly frivolous. Most of the incidents are really funny – both “funny ha-ha” and ”funny peculiar”; and even the administration of ‘six-cuts’ to some miscreants is passed off to some-one else beyond or below ACARA. Poor State Department. The boss-principal had to do the dirty work in our day. There is a serious side. One wonders if any ACARIAN or NAPLAN supporter or fence-sitting politician has ever been in a classroom where test-induced tension prevails. It can be like water-torture at its most efficient. Nervousness and agitation pervade the atmosphere. It’s thick with created tension. Wonder at what the test might contain and worry. worry, worry is in the air. It’s in the faces and the gestures and the antics. As the test gets going and the teacher empathizes with the obvious tension, the temptation to help their young friends…somehow… must be great. They can’t. Those who do…maybe a few minutes extra..maybe pointing at an obvious error…maybe a grunt or ‘uh-uh’ at a mistake about to be made…can get mentioned in the SUMMARY OF REPORTED INCIDENTS and the future of a loving teacher is in jeopardy. As a teacher-supervisor or invigilator, you wonder what masochist dreamed up this idea. Why can’t these little people enjoy learning? The Save Our Schools article started with “Several teachers were found to have helped children…” and “Several schools were also found to have encouraged some parents to withdraw their children from the tests’.” As friend Fred would say, “That’s their bloody duty, mate…to tell it as it is! We need more spunky, information-sharing schools with independent points-of-view.” Spunkiness is the only way to contest this malicious, threatening and degenerative regime of fear. We want to know what our principal, unthreatened, thinks of national blanket testing. It’s our kids’ future on the line. We want our [thinking] principal to tell us as it is. It is now reported that one State wants to limit the time spent on practising for the test. Ye Gods. Did one ever think they would witness such a thing in 2012? It knows that wide-scale cheating is going-on and tries to organise/supervise it! One hope that it doesn’t say that it approves of a child-oriented, learning-based curriculum at the same time as it suggests such a thing. Even the shambles are becoming shambled. 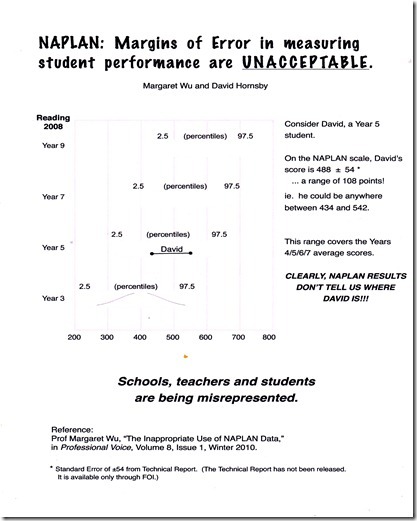 CLEARLY…..this NAPLAN testing is the centre-point of Australian schooling. It defines us as educators…all of us. If you have 4 minutes 17 seconds to spare from your busy schedule, click on the theme song “Care for Kids” above, relax and ‘take in’ the words. It’s quick meditation. Calm your anger. Enjoy. Other Treehorns ? There are 70 others! Check Recent Posts and Archives in the sidebar. The Treehorn Express is dedicated to the cessation of Kleinist NAPLAN testing in Australia. Our recently introduced Australian schooling system is based on one introduced to a New York school district by a lawyer, Joel Klein. in 2002 and copied by Australia’s Ms. Gillard in 2009, without consultation or examination. Mr Klein now heads the Murdoch test-publishing company worth billions. Australian test-freaks are amongst his disciples. Kleinism is a New York version of fear-driven schooling which separates ‘haves’ from ‘have nots’ and opens the door for mega-bank-rolling by known curriculum vandals for control of school-based learning. That’s why it exists. Come on folks. Get off the fence. “Gosh. The first few months at our school it’s just NAPLAN, NAPLAN, HAPLAN. What do you think?” she replied. These are arranged in alphabetical order. You probably have most of them. They are favourites. Each is alive, unique and very enlightening. I know that you will want to preserve contact with all of them. Check them every now and then. http://www.fair.org/index.php?page=4409 An hour-long video. Four outstanding US educators discuss how the media mangled the debate about pubic education. If you have 4 minutes 17 seconds to spare from your busy schedule, click on the theme song “Care for Kids” above, relax and ‘take in’ the words. It’s quick meditation. Enjoy. Other Treehorns ? There are 69 of these on this site. The Treehorn Express is dedicated to the cessation of Kleinist NAPLAN testing in Australia. Our recently introduced Australian schooling system is based on one introduced to a New York school district by a lawyer, Joel Klein. in 2002 and copied by Australia’s Ms. Gillard in 2009, without consultation or examination. Mr Klein now heads the Murdoch test-publishing company worth billions. Australian test-freaks are amongst his disciples. It disrespects school pupils, devalues teachers’ professionalism, forces States to prescribe school texts and teaching strategies and threatens Australia’s future. Why does Australia support it? Weird. Looking forward to teaching in 2012 ? If you hear someone say “I haven’t got time to read.” you know, straight away, that they are not very good at their job…be they classroom teacher, school administrator, principal, senior school officer, banker, clerk, big-business CEO whatever. Take their professional opinions with a packet of salts. It’s a sure sign that they cannot manage time…and time is their most precious resource. If they don’t read about their job, they need to seek another one…pronto. It is really quite noticeable that the most outstanding school principals and teachers are those who read a lot of professional articles and general literature. If I was to name the most outstanding school principals that I have known over the past sixty years or so, reading-professional-literature would be the most common characteristic; and their habit guided their operations with maturity and plain common sense. It was so noticeable. One of them [Bert Townsend] used to copy a short article that impressed him and distribute it to each of the school personnel, about once a week. Not only that, he kept a spare copy for each, bound them at the end of the year and gave the bound second-copy to them for Christmas. Many will remember the methods they used to catch their readings for university study….the meal table, the bus or car ride, the hiatus between week-end activities. I remember leaving a copy of important university notes in the back-yard dunny where a few minutes each day helped to remember some idea that might prove valuable for the exam. Teaching six grades in a one-teacher school was the other activity that demanded time. There was the odd night when some quote or other was required for an assignment…so, torch in hand, it meant a trip up the back yard to retrieve the most recent document from the sawdust bin. Catch-as-catch-can reading such as this can be fun! One shouldn’t waste those odd minutes. I can now get two hours extra reading each week on the push bike at the gym…. 2×20 minutes on each of three days. I feel genuinely sorry for those glum faces opposite staring into space for the same amount of time as they pedal away. I can edit Treehorn Express on a gym bike. It’s great. The present generation of teachers is blessed by quick access to computer articles. ‘Answer Sheet’ by Valerie Strauss in The Washington Post and her inclusion of opinions of others, such as Marion Brady, can be read in Bullamakanka or Kumagutsa as soon as it is printed. No need for a sawdust filing cabinet. Australian readers can, as they read, substitute ‘NAPLAN’ for ‘NCLB’ or ‘RTT’. It’s so easy…and wonderful….and informative. And we can share so quickly and easily. Allan Alach of North Palmerston is the most prolific reader and sharer that I have ever known…and what he reads and shares is so ‘spot-on’. He is amazing. The article itself provides this abstract: “President Obama’s Race-to-the-Top [RTT} is a profoundly flawed educational reform plan that increases standardisation, centralization, and test-based accountability in our nation’s schools. Following a brief summary of the interest groups supporting the plan; who is currently participating in this race; why so many states voluntarily submitted proposals; and what features of the plan are most problematic, eight arguments are offered as to why RTT is highly detrimental to our country”. You will read this in the 11 page article. Only busy people will find the time to read it all, as experience shows. NAPLAN’s focus on high-stakes testing and accountability to raise achievement in math and language arts has a track record of failure. NAPLAN creates a false saviour in charter [aka private] schools. NAPLAN creates hostile-school environments, undermines teacher-student relations, and inflicts the greatest harm on students in greatest need. NAPLAN narrowly focuses the educational goals and energies of school personnel on two learning outcomes at enormous opportunity cost. NAPLAN demonizes teachers, reduces the status of the profession, and ensures that many of our most talented and motivated young people will not become educators. NAPLAN undermines the intellectual, social, aesthetic, and emotional engagement and development of students. NAPLAN threatens the entrepreneurial vitality and economic future of our country , despite, ironically, support from corporate Australia. NAPLAN threatens our democracy due to students’ reduced capacity for informed decision making. Is there a ‘well-known’ or ‘established’ Australian ‘educator’ or organisation [e.g. APPA] or politician [e.g. Peter Garrett] that would care to contest any one of these statements? There is a group of people presently preparing a ‘bundle’ of short papers that highlight the use of NAPLAN in schools. It will be readily available for all to read. It should be first-rate as Professor Margaret Wu, David Hornsby and Lorraine Wilson are amongst the writers. This is exciting. The bundle should be available in time for political parties, interest groups, journalists, schools and principals to decide if they want to continue sitting on the fence. 2012 is crucial for some decisions of this kind to be made. After all, the federal elections are scheduled for 2013 and such decisions can’t be left to the last minute. That’s my opinion, not the writers. WATCH THIS SPACE. Other Treehorns ? There are 68 of these on this site. The Treehorn Express is dedicated to the cessation of Kleinist NAPLAN blanket testing in Australia. Kleinism is a New York version of fear-driven schooling which separates ‘haves’ from ‘have nots’ and opens the door for mega-bank-rolling by known curriculum vandals for control of school-based learning. That’s why it exists. In doing its job for well-controlled legislators, it disrespects school pupils, devalues teachers’ professionalism, forces States to prescribe school texts and teaching strategies, threatens Australia’s developmental future and is just no good. Some Australians go along with it. ????? Kleinism relies on NAPLAN, a non-diagnostic, unreliable, standardised series of tests that are useless, in any case, for the purposes of learning. If one practices at passing tests long enough, one can improve one’s score…. no real learning, just practicing certain things to pass.That’s an easy way to control schools.. Nothing of great and lasting value is learned as a result of such practising. Australia has already spent millions of dollars on this useless enterprise. It does nothing for learners, provides unreliable information for parents and schools, prevents pupils from expanding their knowledge about other things, and is an utter waste of valuable school time. The uselessness of NAPLAN blanket testing is just so obvious. Its maintenance is crazy. It’s a hard-hitting article. Unpersons and supporters of blanket testing won’t like it. Might I dare to suggest that you print it, re-read it and think about its revelations? NAPLAN WILL REMAIN UNTIL ENOUGH GOOD PEOPLE SAY “STOP IT”. David Hornsby http://www.davidhornsby.com.au has supplied the following revealing information in his recent handouts. ___________________________________________________________________________________________Other Treehorns ? : Check Recent Post and Archives in the sidebar.